When Prince Louis was born I was asked whether I would create another heirloom collection, as I did for Prince George (Le Bebe Royale) and Princess Charlotte (Une Petite Princesse). I adore designing heirloom embroidery so I needed little more encouragement. Every heirloom collection I have created focuses on at least one new element of heirloom embroidery. I decided that I would do some lace type fills that mimic lace insertion but because they weren’t actual lace they could be quite narrow and dainty. Along the way it occurred to me that perhaps what I had digitised would be perfect for shadow work too. 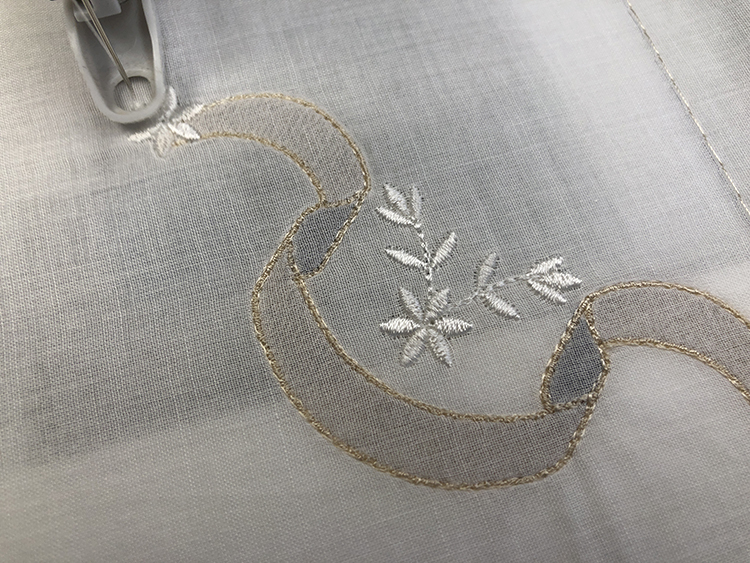 While staying with my dear friend Pamela Cox, I learnt how easy this technique is to do providing satin and motif fills have a stitched outline. It was worth testing out. 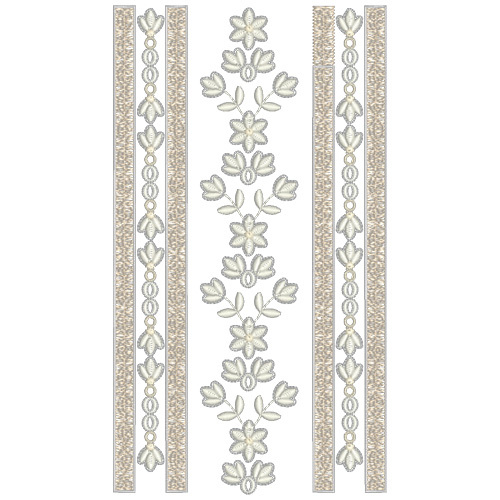 The scallops, ribbons, cross and panels in this collection have quite an open fill stitch to represent lace, and this has been given a narrow border. Actually that is all you need for shadow work. When I realised the potential of these designs, I hooped two layers of Sulky Soft n Sheer. Here you can see the main part of the ribbons stitch in Sulky Rayon 1085 Silver and the inner parts stitched in Sulky Rayon 1805 Putty. I prepare my fabric and hoop my work on my wonderful June Tailor cushioned board which enables me to press small pieces of fabric and align them accurately too. 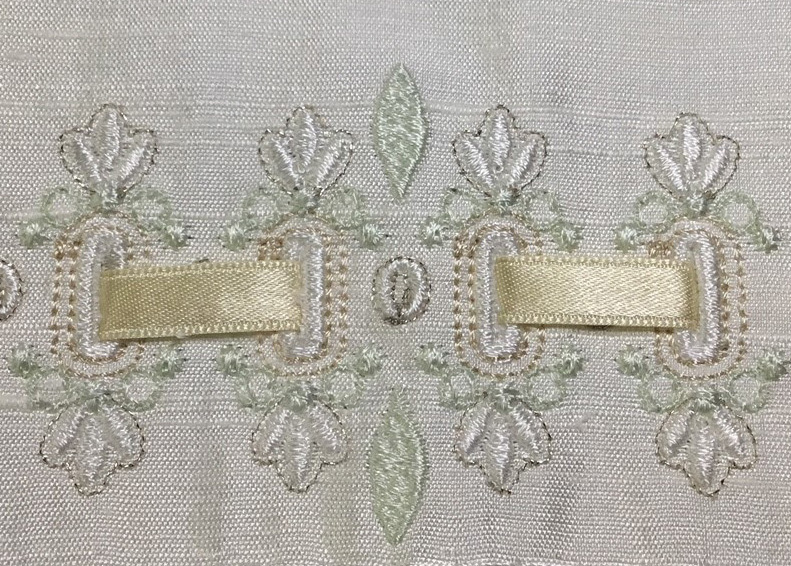 There is nothing worse than embroidery that does not site along the warp or weft of a fabric. When working with just hooped stabiliser I can line up my work accurately matching the centres of each side of hoop with the gird lines of the board. The other side can be used for cutting fabric with a rotary cutter. A marvellous piece of kit I would not be without. Back last year when I visited the Delectable Mountain Cloth shop in Vermont I bought some wonderful semi sheer cotton batiste and decided to test my shadow work on this. 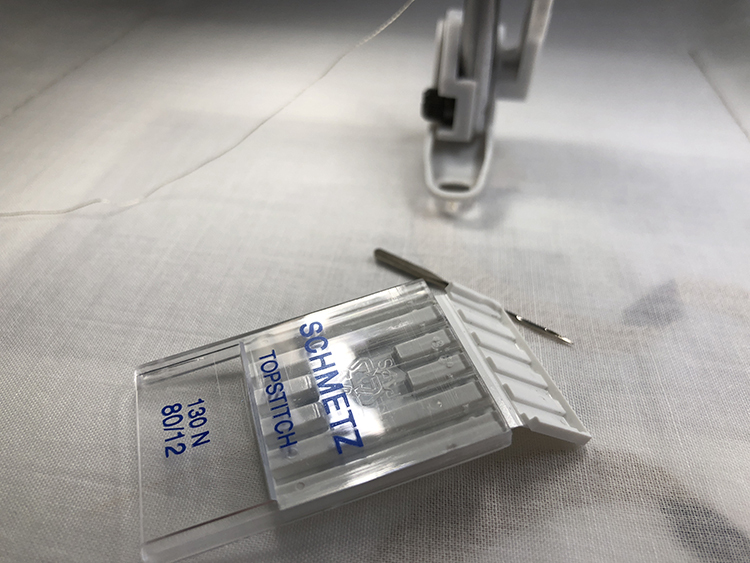 I selected Schmetz Top stitch 80/12 which is the narrowest of top stitch needles. Having pressed and steamed the batiste I applied it to the embroidered stabiliser with some temporary adhesive (use well away from computers, devices and machines) and secured it in place with a box of fixing stitches. 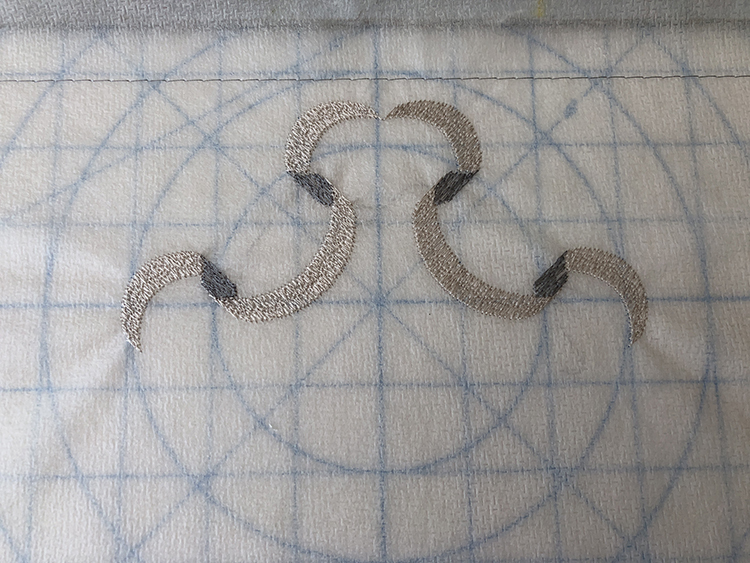 If your machine does not have this feature use the 2nd set of Outline Alignment stitches (blue) which are an option on most of my designs. You can see how beautifully sheer this fabric is, and that is needed so the colour of the stitches underneath show through. 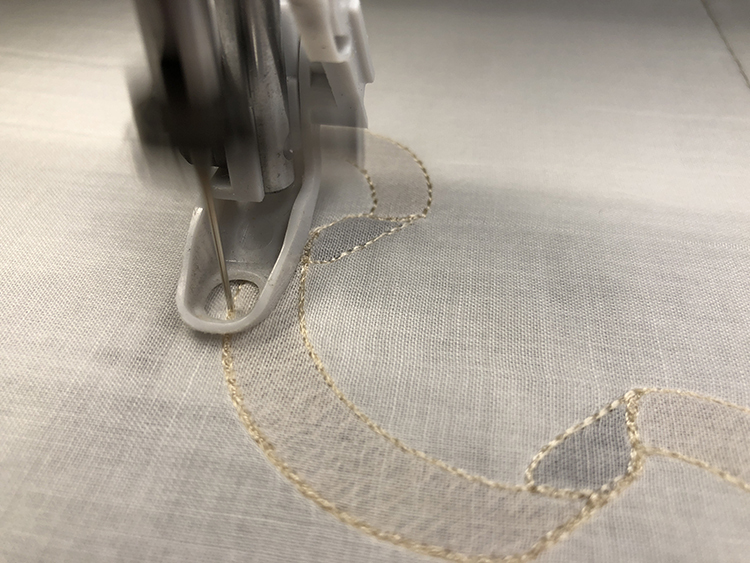 When the embroidery is finished you will need to carefully trim away the stabiliser at the back and that’s how easy it is. 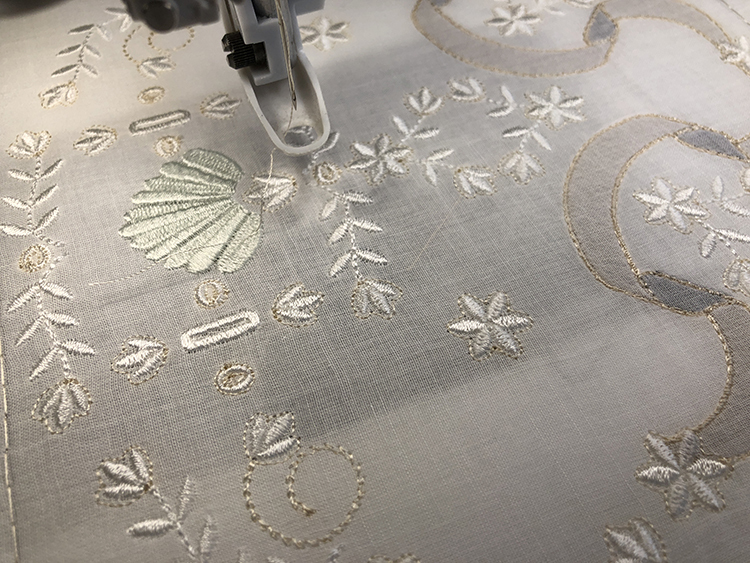 I have tried not to create too many flowers in this collection, so it can be used for Christening gowns and other heirloom projects for both boys and girls, so there are just very delicate sprigs and six petaled flowers with an outline. The colours that you use for your embroidery will also give them a boy or girl theme. 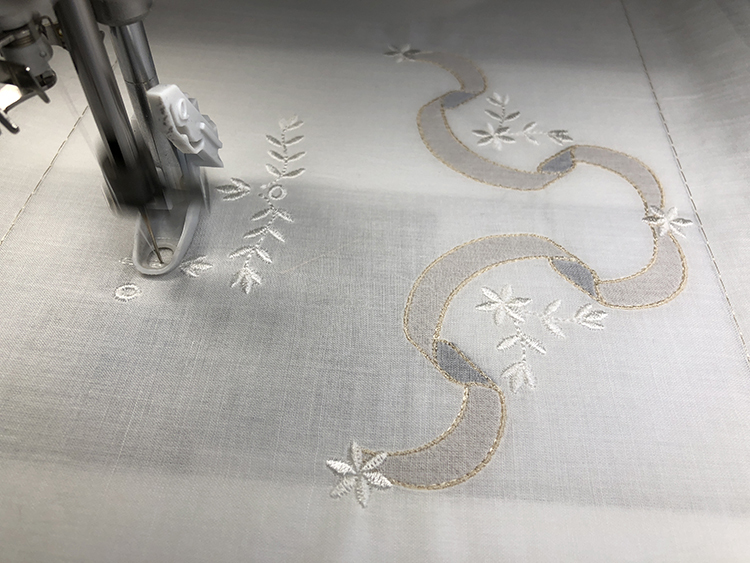 As you can see this was a large embroidery featuring several of the smaller designs, that I combined to test out designs for the larger hooped sets in the collection. The results were stunning and I was delighted. 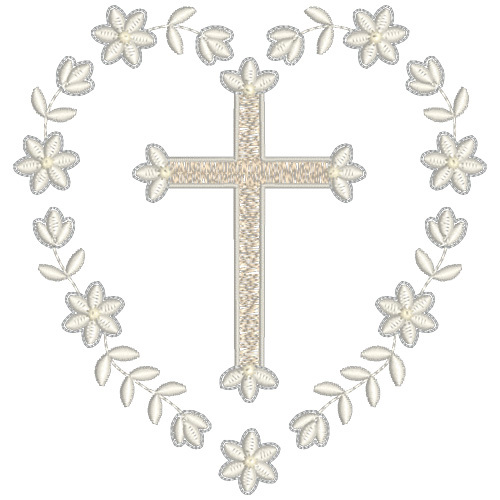 So much so that I must plan to embroider a Christening gown very very soon, maybe as I work on these designs. I have added a pretty buttonhole, several different scallops, two shells and a cross to the collection as these items are used frequently in heirloom embroidery. 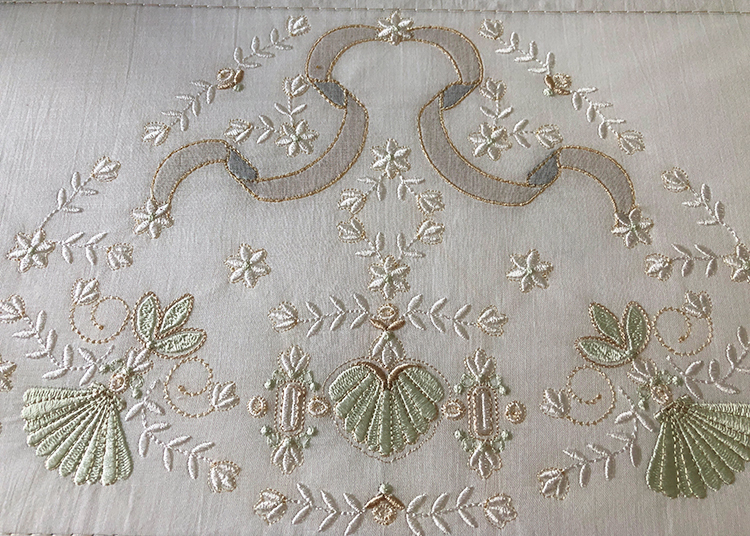 For this embroidery I used Sulky Rayon 1063 pale yellow green for the shells, but a pink or blue pastel colour would work just as well. 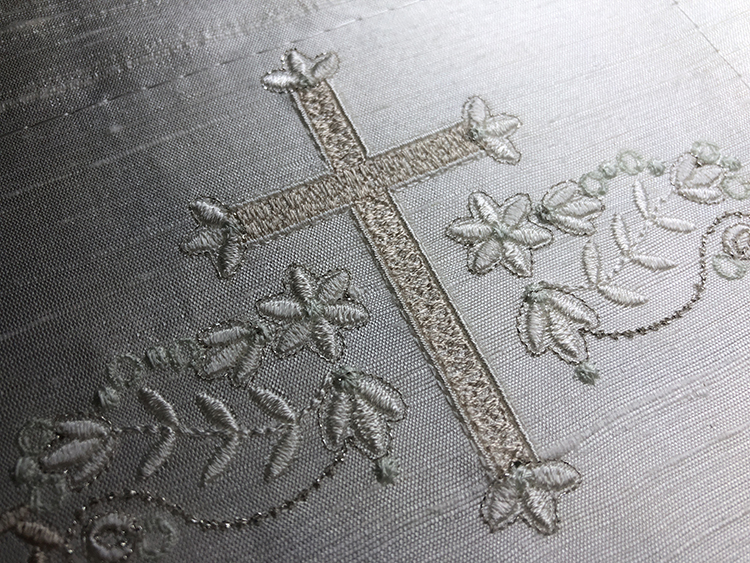 The outlines and tiny chain stitches can be embroidered in metallic thread. I used Sulky Rayon 0520 sand for the cross, scallops and ribbon work. If you want these to look more like lace I suggest that you use an ivory thread. I noticed that the underlay was popping out on the edge of the cross and that was because it wasn’t quite square at each corner. That has been sorted. I like to include buttonholes in my collections as they can be used for much more than just buttons. Left uncut there are decorative but they can be used for threading ribbon or prepared fabric ties. What do you think about this look using sheer organza ribbon? This first set of designs containing 28 designs, is now available. Here are two designs from the next set for 5″ x 7″ hoops, which will be released in a week or so. There will eventually be 5 sets in this collection. The other sets will be for 240mm x 150mm, 360mm x 150mm and 300mm x 200mm. 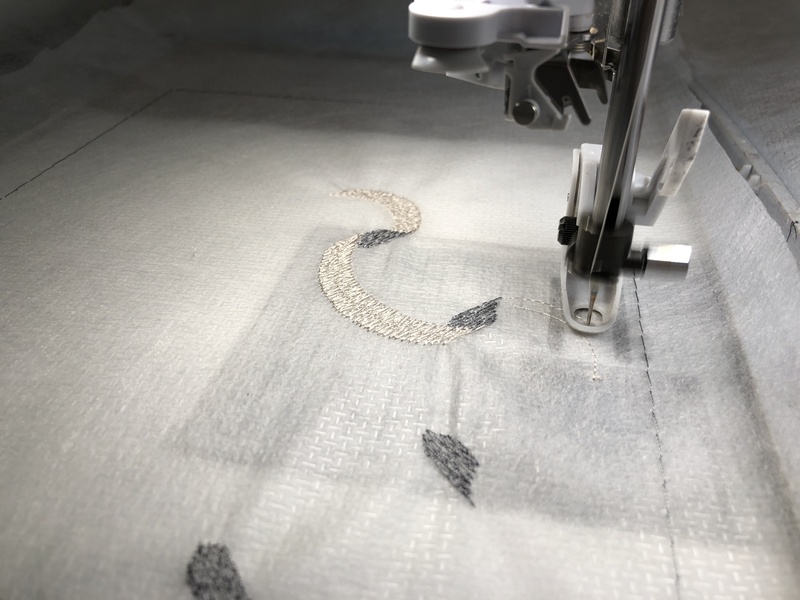 This entry was posted in Discussing machine embroidery, New Designs and tagged development of embroidery, heirloom embroidery, machine embroidery, shadow work. Bookmark the permalink. Just a sheer delight to create and I really must make my first babies gown. Wow, Hazel… These are absolutely stunning! You are one very talented young lady! You have created another fabulous tutorial on how to use your new upcoming heirloom collection as shadow work. Your written instructions are easy to understand and the step by step photos add visual instruction. You always describe the fabrics, stabilizer, and thread that you use, and I find this very helpful..
Breath-taking as all of your collections!!!! I love your heirloom collections. I use them for all the new babies we have had. Your attention to digitizing is what makes your collections my absolute favorite!!! Job well done!!!! I look forward to the entire collection! Oh that sounds wonderful. Please could send me some photos of the projects you have made for all the new babies. I would love to see what you have made. Hello, I’m always looking at your website. The designs are so pretty . My Husqvarna dealer recommended them several years ago for my machines and I have found them to be great. When I call in I always ask what’s new and what have you discovered? It may be different for other machines. This set is so impressive (well, All of your sets are!) but this catches my eye with it delicate beauty. Looking forward to the entire collection! Your comment has been chosen as comment of the week. Thank you. You are way ahead of anyone else!